US President Donald Trump, who is on his way to Singapore, has said next week's summit with Kim Jong-un is a "one-time shot" at peace. A meeting between Mr Trump and the North Korean leader Mr Kim will take place on Tuesday. 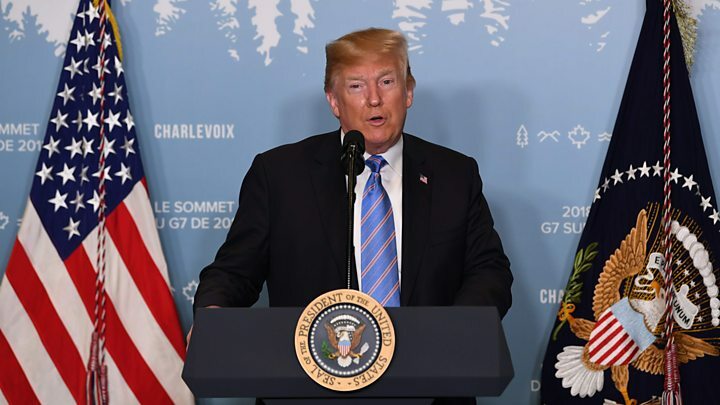 Mr Trump described the summit as a "mission of peace" but said the two leaders were in "unknown territory in the truest sense". Mr Kim is also reported to be on his way, along with aides and guards. This is only his third trip abroad as leader - his previous two visits have been to China and took place in the last few months in the build-up to this summit. A plane travelling from Pyongyang arrived in Singapore in the afternoon local time, but it is not known if Mr Kim is on board. Their meeting will be unprecedented as it will be the first time a North Korean leader has met a sitting US president. The men will have a day before coming face to face at the island resort of Sentosa on Tuesday morning. Before that they will also both meet with Singapore's Prime Minister Lee Hsien Loong. Mr Trump comes to Singapore after falling out with other world leaders over tariffs at a G7 summit in Canada. As he left Canada, he tweeted an upbeat message about the forthcoming summit with Mr Kim. Washington hopes the talks will kick-start a process that eventually sees Mr Kim give up his nuclear weapons. The US president successfully sought to tighten UN sanctions on the North, and to get its traditional ally, China, to go along with this. He also famously vowed to unleash "fire and fury" if Pyongyang kept threatening the US. 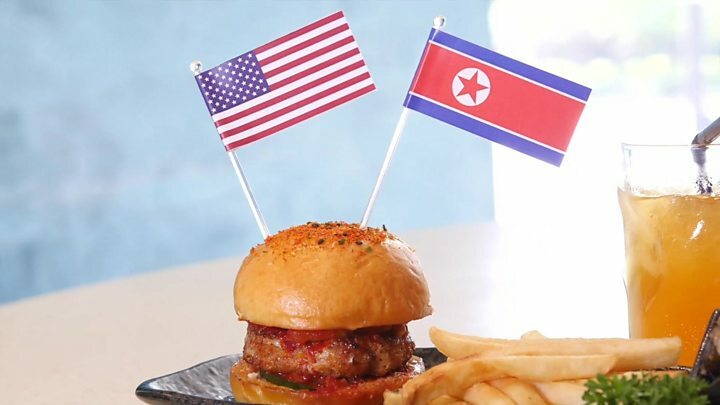 Media captionTrump-Kim summit: Can you achieve peace on a plate? In early 2018, a remarkable turnaround in the relationship occurred. It started with significant diplomatic overtures from North Korea towards South Korea during the Winter Olympics in Pyeongchang. Since then, the path to the summit has been rocky and uncertain, with Mr Trump at one point calling it off completely. But after some diplomatic scrambling, the two leaders will now sit down together. What do the two sides want? But this does not mean the US is expecting to get a final deal in Singapore. President Trump has described it as a "get-to-know-you situation" and said "it's going to be a process". What do N Koreans know about the summit? Analysts say that Mr Kim, by winning the prestige of a meeting with the world's most powerful leader, has already gained a victory. They also question why he would give up his nuclear weapons after pushing so hard to get them. Some say he would never do it, perhaps unless everyone else on the Korean peninsula disarms too - including the US. 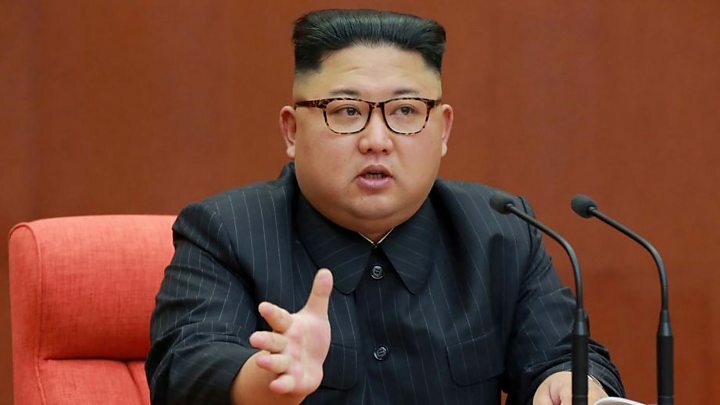 However, Mr Kim has also said he now wants to focus on building the North Korean economy - and thus wants sanctions relief and international investment. The question is what concessions he is willing to make, and whether he will stick to any promises made. Pledges to scrap the nuclear programme have been made before by his predecessors. US Secretary of State Mike Pompeo, who has met Mr Kim twice in recent months, said he believed he "is prepared to denuclearise" and agree "big and bold" changes. But the North Koreans have not given much away about their position. It is a safe destination and the government has proven itself a reliable host for previous high-level meetings. Protests without a police permit are banned - so there's little risk of disruption. Singapore is also a close US ally, while being one of the few countries that has done business with North Korea and still hosts an embassy. The Kims are also said to feel comfortable in the wealthy and hyper-modern country. The pair will meet at the five-star Capella Hotel. Sentosa is a luxury playground just off Singapore's main island. It's home to golf courses, private marinas, fine restaurants, a casino and a theme park. But they will both stay at hotels on the main island. Access to Sentosa can easily be controlled - there is just a cable car, a monorail, a pedestrian causeway and a vehicle tunnel. How are other powers seeing this? South Korea has pushed hard for the summit and wants it to be a success. It has acted as a go-between between Washington and Pyongyang, and President Moon Jae-in wants a formal end to the Korean War. Marches in support of the summit took place on South Korea's capital Seoul on Saturday. China, North Korea's traditional ally, will be watching closely. It does not want its strategic interests to be marginalised in any deal and moved to maintain influence before the summit by inviting Mr Kim to Beijing. Experts say its nightmare scenario in the long-term would be a reunified Korea with a US military presence on its borders. Japan has long lived with the threat of living next door to the Korean peninsula - and its main priority is a strong commitment from Pyongyang that it will end its nuclear programme. However, Tokyo has also pushed the White House to bring up the politically significant issue of Japanese citizens abducted by North Korea. Video Trump Kim summit: Can you achieve peace on a plate?